For years upper-middle-class moms and hippies have maintained that organic foods have higher nutritional value. They seem to have the mistaken belief that plants that aren’t sprayed with pesticides and herbicides boost their production of vitamins and antioxidants to combat weeds and bugs. Unfortunately, much like everything else they believe, this turned out to be nonsense. Stanford University doctors reviewed the data and determined that there are few health benefits from eating organic food. The food was no higher in vitamins or minerals, and though it was tested as lower in pesticide exposure, the rates were so low as to make little statistical difference. Science aside, some people claim they can taste the difference and organic foods have a richer, crisper flavor. According to my own unpublished study, those people are morons. If anything, it hurts the flavor. 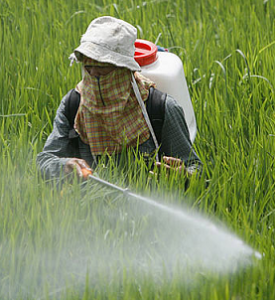 If the EPA rejects a pesticide for use in the U.S., the big chemical companies usually just sell it to the third world where regulation is more lax. I personally love peaches and apples from impoverished lands because their powerful pesticides really give the fruit a special zip. This is doubly true for anything grown in Mexico. I have no idea what sweet chemicals they’re using down there, but I once ate seventeen unwashed Mexican plums, and I’m fairly certain I had an acid trip. Try getting that from your stupid organic produce. I love your rants. Some even make me laugh out loud while sitting alone. But I buy organic produce whenever possible. It may not have more vitamins and minerals than those sprayed with pesticides but they certainly are not harmful to our health as are those sprayed with pesticides.